When you hear the word Fallon, what do you think of? Do you think of the small city east of Reno? Or do you think of the popular talk show host Jimmy Fallon? Reynolds School alumna Caren Roblin knew the answer to that question. As Director of Content for Sierra Media Group, she has a knack for social media. When Roblin visited Lahontan Valley News In Fallon, Aly Lawson, a reporter for the paper told Roblin that when people searched Fallon online, they came up with the talk show host, not the city. Lawson had the idea to send a care package to Jimmy Fallon. Roblin said she’s focusing on Instagram, using the Lahontan Valley News’ account to spearhead the campaign. “I was thinking Instagram because this would be a visual campaign, and Twitter isn’t huge in this market,” she said. Lawson has been working with local organizations to help the campaign get more attention. “It’s also a great way to strengthen community relationships,” she said. Lawson talked with the mayor, the school district and Fallon’s Naval Air station. She’s keeping Jimmy Fallon cutouts at the Lahaton Valley News office for anyone who wants to pick one up. 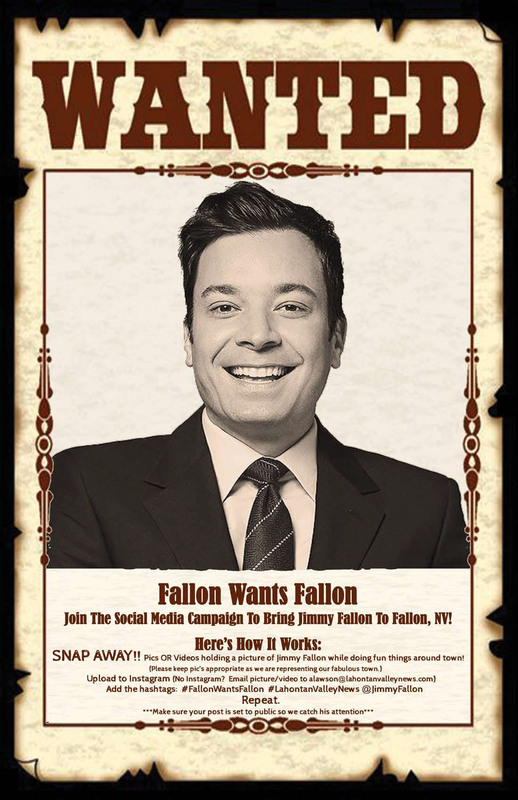 The care package, sent at the beginning of May, was filled with Fallon-themed things, including a handwritten note to Jimmy Fallon. There’s cantaloupe jam, Fallon coffee, mugs, and items from the Chamber of Commerce, as well as Fallon postcards all over the outside of the box. As of yet, neither NBC or Jimmy Fallon have responded, but Roblin says she’s hopeful. “It feels like it’s blowing up around here,” she said.